Today I've got news about bonuses and freeroll slots tournaments for my friends in South Africa. The R10,000 April Foolsroll slots tournament has just begun at South Africa’s favourite online casino, Springbok Casino. 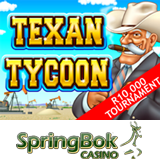 You have until the end of the month to achieve the highest score on the popular Texan Tycoon slot game. So definitely take a shot at the tournament but also check out the Game of the Month, the new Lucky 8. You can get free spins, free money and double comp points if you take it for a spin. You can also still pick up bonuses to try the new game launched last month, Shark School. Three Oil Well symbols in Texan Tycoon triggers up to 25 free spins where all prizes are tripled. Lucky 8 is a 25 payline Chinese-themed slot game with exotic images of the Orient spinning on its five reels. It features the Win-Win feature that makes everyone a winner in the bonus round. Springbok Casino offers more than 350 online casino games and ten of its most popular slots are also available for iPhone, iPad and Samsung Galaxy S3/S4 users.